An agreement has been reached between appellant parties for a development of up to 1500 homes at Auckland’s Three Kings, proposed by owners Fletcher Residential. 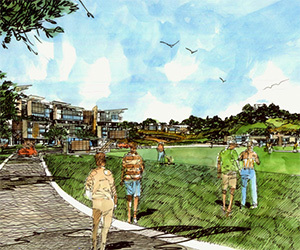 The proposed $1.2 billion housing development will convert a derelict quarry into a modern, integrated, inner-city community with a town centre, public spaces and playing fields. The development was proposed more than five years ago and has been subject to over 100 consultation meetings and dozens of High Court, Environment Court and commissioner hearings. Residential community groups went up against Fletcher Building and the Government, who both supported the development. The parties have reached an agreement, after Fletcher made changes to its plans, including up to four metres of additional fill in the former quarry and increased height in the apartment buildings along Mount Eden Road. It means that all appeals will be withdrawn, and construction will begin in summer. The Three Kings housing development will be respectful of local landmarks such as the maunga (volcanic cone) Te Tatua a Riukiuta (Big King). It incorporates planting, walkways and the new wetland area for improved biodiversity and storm water management. The development will commence this summer with the first homes completed in 2019.